If DNA is to reveal anything, we're a bit of our parents. And, as it turns out, we're a bit viral, too. 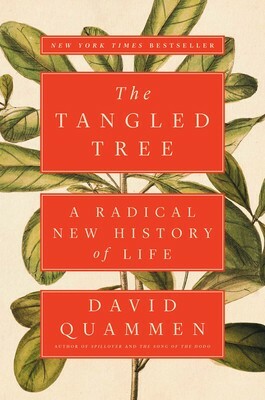 In a recently-published book, "The Tangled Tree: A Radical New History of Life," nature writer David Quammen reveals the journey to discovering that 8 percent of the human genome has viral DNA — in other words, we've got the building blocks for bacteria and viruses in our own genetic make-up. "We think of ourselves as individuals, but in fact we are mosaics," he said. "We contain some ancestry from bacteria, some ancestry from viruses and some ancestry of course from other primates. So it binds us even more closely to the rest of the natural world." The phenomenon behind the discovery is called horizontal gene transfer, which refers to genes actually moving sideways across species. "This is supposed to be impossible," said Quammen, who will be speaking at the Wisconsin Book Festival on Thursday at 6 p.m., at the Discovery Building in Madison. "I thought I knew a couple of good reasons why it was impossible, but it turns out it is possible." Quammen said this type of gene transferring happens much more commonly between bacteria and archaea, which are single-cell microbes. "But it happens also in higher creatures, so that we humans contain some stretches of DNA that have come to us sideways from bacteria, and sizable stretches of DNA that have come to us sideways from viruses in the course of viral infections that have gotten into the reproductive cells of humans and been passed down," he said. Genes jumping across the boundaries dividing species poses problems, such as antibiotic resistance, Quammen said. If a strain of bacteria takes the time to become resistant to antibodies through mutation, it can pass that resistance gene onto other bacteria. "That's why antibiotic resistance has spread around the world so, so quickly and is now killing tens of thousands of people every year," Quammen said. For years, the biological hierarchy that explained the divisions of life began as two categories of celled organisms: eukaryotes, which included the Kingdoms of animals, plants and fungi; and the prokaryotes, which included the bacteria kingdom and other microbes. In 1977, microbiologist Carl Woese revealed that prokaryotes should in fact be two categories to better differentiate the distinct bacteria and archaea, single-cell organisms with simple structures, Quammen said. Woese's early genetic sequencing research concluded that archaeans were actually more similar to humans than they were to bacteria. "These things are now known as archaea because they are thought to be perhaps related to the oldest forms of life on Earth," he said. Woese's research into early genome sequencing — which is the process of figuring out the correct order that four chemicals, called bases, appear within a genome — contributed to the development of molecular phylogenetics. This field involves sequencing the DNA within living things and comparing it to other organisms to see whether there's a close relationship that exists between them and at what point those organisms diverged. It was that process that led scientists to discover that some genes were moving between species and in some cases, even kingdoms, Quammen said. These ideas don't overturn Darwin's theory of evolution that the stronger species prevail; rather, Quammen said this supplements it by confirming that mutation isn't the only way that genomes change. "It doesn't just happen by incremental changes when DNA copies itself inaccurately by one letter or a few letters," he said. "Innovation can also come into a genome in ... packet of genes coming in sideways by horizontal gene transfer and providing new innovation, new material on which Darwinian natural selection acts." This discovery is re-imagining how the proverbial tree of life is depicted, Quammen said. Instead of limbs branching off from a single source, as Darwin suggested, the tree now looks like one branch growing into another branch and carrying its sap with it. "It's humbling but I think it's also majestic and exhilarating to get this dawning new understanding of our human identities," he said.